The PS75 Series pressure switch has all metal surfaces for overload stops and deliver reliable operation under extremely high pressure surges. They are designed with a wear disc and cushioning ring for increased life. 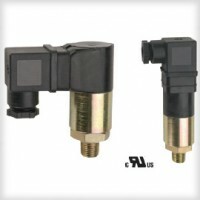 The switches use a piston/diaphragm design, which combine the high proof pressure of piston technology with the sensitivity of a diaphragm design. They can be field or factory adjusted.